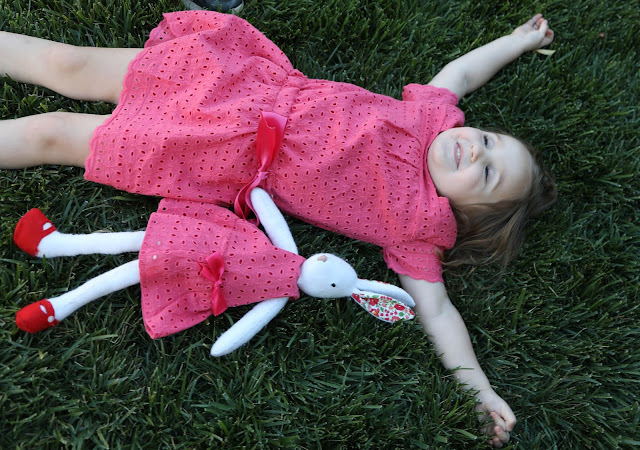 Inder Loves Folk Art: Maggie Joy turns FIVE! Maggie turns FIVE on Sunday, people! I KNOW, RIGHT? Wasn't I just posting about being pregnant with her five minutes ago? Time is so weird. SO EFFING WEIRD. Well, don't worry, I'm not going to get too maudlin about it. I am subsuming my sentimental reactions into sewing, as I am wont to do. So, okay, baby girl needed a birthday dress, obviously. 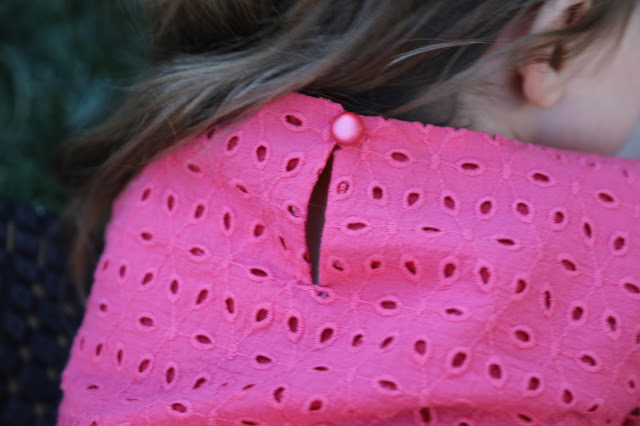 I have heaps of fabric I bought with Maggie in mind, but most recently, I bought this gorgeous coral/dark pink eyelet at Stone Mountain and Daughter (ironically, this eyelet is shown in the image for "Cotton Eyelets" generally, but no longer available for sale, sorry!) when Maggie and I were shopping for Luna Lapin. Both Maggie and I were all the heart eyes at this color - it's pink! But an interesting, coral pink! I bought a yard and a third, thinking I could squeak a dress out of that amount, and then it shrank in the wash, so I had more like a yard, probably 48 inches wide? C'est la vie. Luckily Maggie is still a wee lass! She still measures size 3T in most patterns. I debated a while about what pattern to use. I considered some of the ruffly patterns that recently came out, like the Polina or the Marlowe, both of which I bought right away and can't wait to make, but the Polina's frills are cut in a spiral (like the Geranium dress shoulder ruffles, totally awesome, but not good for using a straight grain eyelet lace edge), and the yardage was a no-go for the Marlowe. So I decided to dig deeper into my stash, to some Oliver + s patterns I owned but had never tried. And that's when I decided to try the Croquet Dress. This pattern calls for one and a quarter yards for this view, but I had a suspicion that I could work it out, cutting everything on the cross grain, and without hems for the sleeves and skirt, and I was right! This is the sweetest pattern! What took me so long??! 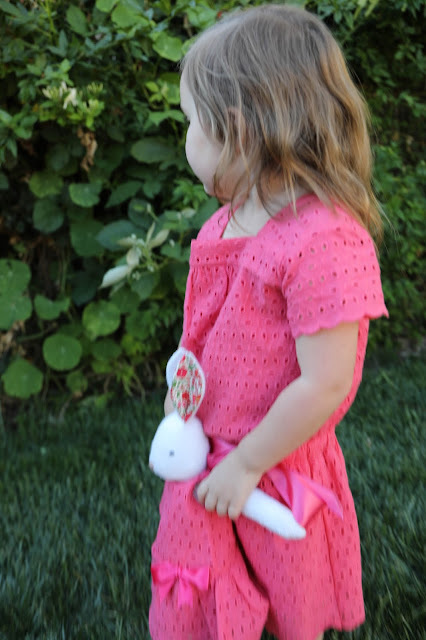 It's the perfect little Edwardian dress for a little girl! Nostalgic, old fashioned, and lovely. I can't wait to make it again, maybe in seersucker? It is so pretty! Hashtag #alltheEdwardiandresses (You can also make a pretty blouse from this pattern, btw.) In eyelet, it's everything I adore about A Room With a View minus the constraints of Edwardian social mores. It took some ninja layout skills, but I managed to cut this dress out from a mere yard and change. The bias waistband had to be pieced, but because I lined the dress, I did not have to cut out shoulder strap or yoke facings. Heck, I even managed a matching dress for bunny! YAY!!! 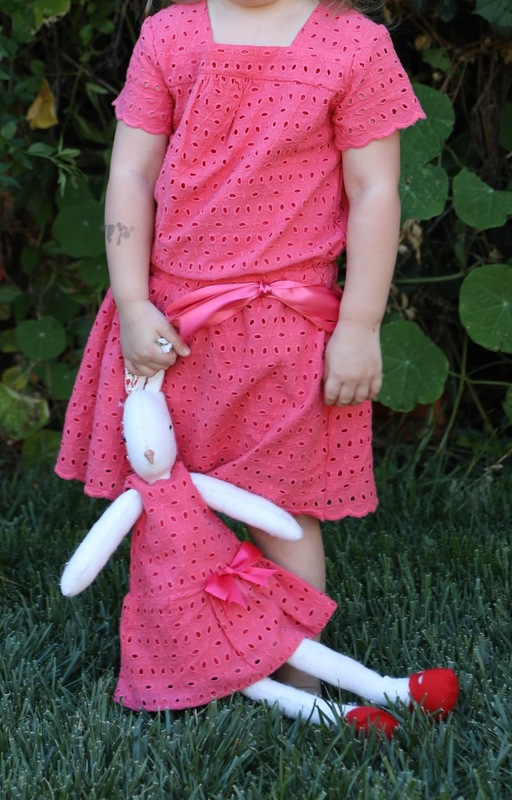 I cut this out in size 3T, with a bit of extra length (which is easy to do when you're dealing with eyelet and not planning to hem - just put the bottom of the skirt on the lace scallops!). The length is perfect, but it is actually a bit big in terms of shoulder width? Next time I make this (new fave! ), I'll take it in across the chest an inch or so. It's totally wearable as-is, but there's a little extra fabric across the front that you can see below. I lined this dress in raspberry/pinky red cotton voile, also from Stone Mountain. It was the perfect lining for this fabric - lighter colors looked awful, but darker colors (purple) showed through the fabric. This lining deepens the intensity of the pink eyelet in the best way. The sleeves are the only part of the dress I left unlined. Lining this dress increased the complexity of construction a tiny bit, but even so, it was such an easy make! After working on several projects for myself (blog post pending! ), this felt SOOOOO easy and fast! As usual with Oliver + S patterns, the instructions were excellent. One little snag - because this dress is in eyelet, and so is the bias waistband casing, white elastic showed horribly through the fabric. I solved this by running pink satin ribbon along with the elastic, to cover the white. This worked well, although it made the waistband a bit bulky and quite "firm" as Nicole would say. Which then aggravated another issue - with this one lovely keyhole opening with button in the back, it's not the easiest dress to get on and take off - and my "firm" waistband worsens that quite a bit. It's a bit of a struggle, honestly, but thankfully Maggie loves pink party dresses so much she will tolerate that (no comment). For my next version, do you have any suggestions for making it easier to get in and out of? More buttons? A back button placket? Let me know! This was my first thread loop, amazingly. See, I always pick up new skills from O+S patterns, even old ones that are really easy! Maggie Joy was pretty happy with her birthday dress. She was even happier to learn that I had made Luna a matching dress!!! When I was Maggie's age, I went bonkers for that sort of thing as well, so I was only too delighted to make that happen for Mags. (Plus, bunny clothes making is my new obsession! Because FUN!) This combo was an early birthday present for Mags-a-licious and I'm so glad she likes it, even if, frankly, neither her dress or bunny's is that easy to get on and off!! Ha! I know you're all dying to know the deets on the bunny outfit. One of the patterns in the Luna Lapin book is a cute lace tank top. I used that for the bodice of the dress and then winged a gathered skirt. After all my ninja cutting for Maggie's dress, I did not have enough scalloped lace to do Luna's skirt, so it's just hemmed, but both dresses have the same raspberry voile lining. Five does seem like a momentous age, even though we've decided to keep Maggie in preschool another year, so she'll be six when she starts kindergarten. Her teacher feels like she could develop more in social confidence, plus she's teeny-weeny. And public kindergarten is a lot more academic (and, ahem, less fun) than it used to be, at least in my 'hood, so I am in no rush to push Maggie into that environment. We're super blessed to have a fantastic (and affordable) preschool and a loving and supportive preschool community that we've been involved in since Joe started right after Maggie was born, so that helps too. But still, five is a biggie. 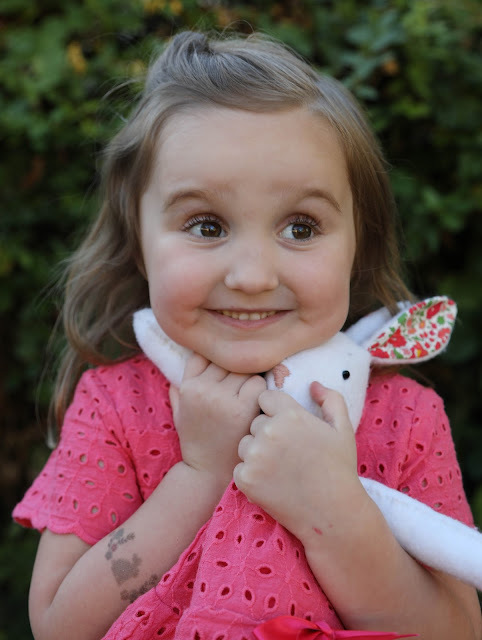 At any rate, Maggie is the most super delightful kid ever! (Except when you try to feed her, but that's a story for another day - this kid is a PICKY EATER, all caps.) She's sensitive, perceptive, creative, artistic, a great sewing partner, and funny as all get out! She and Joe really, truly, dote on each other. From toddlerhood, it was obvious to us that Maggie appreciates and accommodates Joe as much as the reverse. It's wonderful to see, and I'm so lucky to be the mama of the two best kids ever!! (Not at all biased.) Margaret Joy, you truly live up to your middle name! Happy birthday, baby girl! Aw it's great Inder. I was delighted to see you try this pattern as it's one that gets overlooked, perhaps for its lack of twirl factor, but it is so delightful! Happy birthday to Maggie and bunny! Aw, she reminds me of Iris. So joyful! That first photo belongs in a frame! I love the last one, too. Her hair is so beautiful and her eyes so expressive! The matching dresses are amazing! Oh, Maggie's smile in that close-up photo is so adorable. She's clearly delighted with the dress, which is just exquisite. And WTG getting a bunny dress out of the cut, too. I can't believe Maggie is 5. Wasn't she just 3 like five seconds ago? That dress is so sweet! It looks great on Maggie and I love that Luna has a coordinating dress. Maggie is looking like such a big girl-- I love that smile in the last picture. My Andrew turns 5 this coming Sunday and we have made the same decision about waiting one more year for kindergarten. He needs more time to develop some of those fine motor skills. And I need more time before he's a big kindergartener!